I finally feel like our living room is looking complete. When getting the new house, I was excited to be able to decorate a mantel as well as get a larger entertainment center that could house adult decorations as well as Noah's toys. I call this the living room, though it is not a formal living room by any means. Instead it is actually the room that we LIVE in. Since Noah is a HUGE part of our lives (really he's the center of our universe), this room is also where we keep his toys. I like being able to watch a show or make dinner (in the next room) while he plays. But just because this room is where he plays doesn't mean I didn't want to include some more decorative touches. I love that the top three shelves are mine and the bottom three shelves are for his toys. As he gets taller I may have to move things around so he doesn't break my things ;) I feel like styling bookcases is a constant work in progress and I will probably change them with the seasons, but for right now I'm happy with how they look. And then of course there's Noah's toys. We got some baskets and boxes at Target and then put his trucks on display. We definitely paired down the amount of toys we keep upstairs and the rest live in the finished basement. I plan to rotate toys every few months. Most of the time he just plays with his trucks anyway so he doesn't seem to mind the other toys not being here. I shared the reading nook we made for Noah here. I am shocked to say that he is still keeping that area fairly neat. I think that corner is where we will end up putting our Christmas tree though, so I will need to find another place to keep his books for the month of December. Speaking of holidays, I'm super excited to have a fireplace and mantel so I can decorate for each holiday. Right now I've kept it super simple with just a mirror, vase filled with fake flowers, and some LED candles. I found the candle holders at Target, the vase and mirror are from Home Goods, and the flowers are from Michaels. I'm looking forward to switching things up in a few weeks for the Fall :) I also still haven't decided whether I want to keep the mirror leaning or hang it on the wall a few inches above the mantel... thoughts??? So that's our living room. 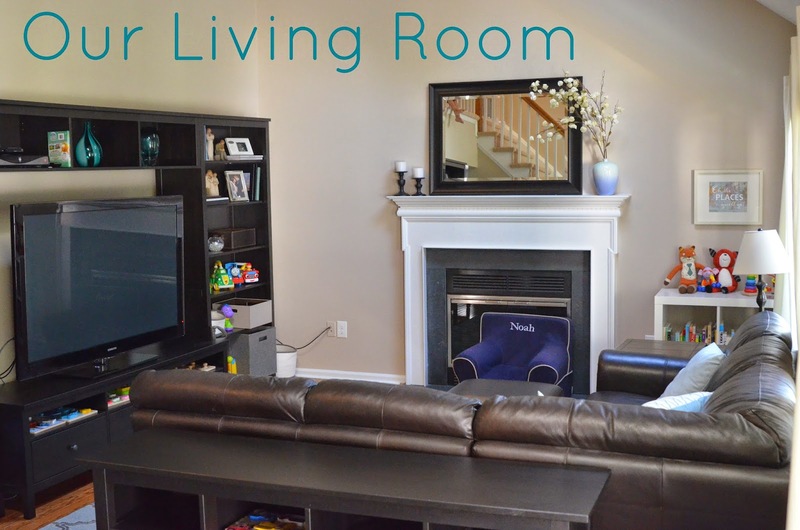 Do you have a formal living room and a family room? Do you keep your kids' toys separate from your main living space? I love the reading nook area! And I love the view from above. Your living room looks so inviting and warm. The couch is perfect for the space and I love the rug! We LIVE in our living room too. The kids have a playroom but seem to drag their toys into my living room daily. I'm constantly picking up and putting them back in their playroom! Your living room is beautiful. I love your mantle. I'm so jealous, I want a mantle.